Although Panel Built’s typical modular office uses our standard vinyl covered gypsum wall panel, we offer a wide variety of different modular office wall panel materials, each with their own specific benefits. We provide all of these different options because we pride ourselves on always delivering the perfect structure for our customers’ needs. We have manufactured modular warehouse offices and exterior buildings for a variety of unique purposes, climates, conditions, and work environments. So, why would your facility need a fire rated modular office? Insurance companies will often require that buildings that come in contact with flammable materials receive higher fire ratings. If your warehouse holds flammable liquids (any liquid with a flashpoint at or below 199.4 degrees), your insurance company could require any modular office building to hold a specific fire rating for liability purposes. But more importantly, in a facility with a higher level of risk, these fire rated wall panels provide exceeding protection to your employees. Not only will the wall itself provide valuable protection, but it can also provide a comfortable work setting for employees or housing for equipment. To receive the 1 Hour Fire Rating, these panels were tested by a certified independent laboratory and the results met the ASTM Method E119-00a Fire Test for a fire endurance rating of 60 minutes. The panels are blasted with flames for one hour followed by a blast from a fire hose. The wall must remain intact to receive the 1 Hour Fire Rating, and these structures meet the punishing standards. Typically, these fire resistant panels will consist of 26 gauge stucco embossed steel with a 5/8” Type X Gypsum board behind it and 2” mineral wool core. 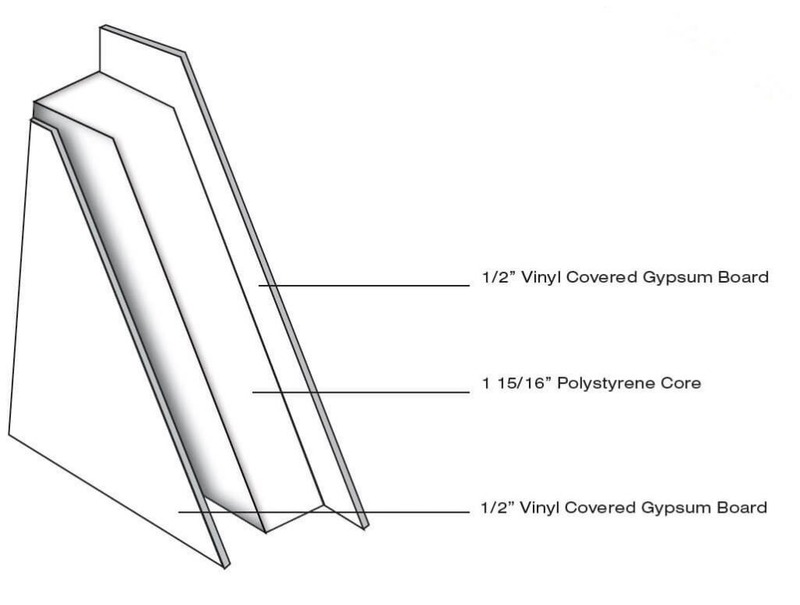 However, these panels can be modified to have a vinyl covered gypsum exterior per customer request. Typically, one of our standard modular offices will be built with a gypsum interior layer and a gypsum exterior layer. 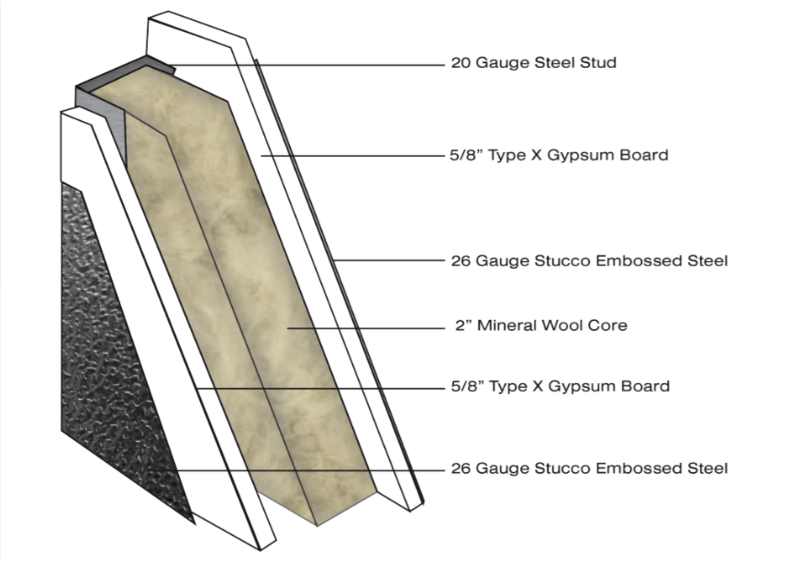 However, sometimes having steel paneling over the gypsum board will provide a better fit for your facility. That is because these panel systems provide an extra layer of protection for your modular office, allowing for incredible durability. This specific type of wall panel can come in handy in a warehouse or facility that sees a lot of foot traffic or forklifts moving back and forth. By being able to absorb more damage than your typical modular office, these specialized panels can actually save you money later on in potential repair costs. These steel panels come in three basic colors, white, saddle tan, and gray, but can be powder coated to a number of different color options. For both interior and exterior modular buildings, Panel Built offers a ballistic rated option for companies that face a high threat level or the do business in a more hazardous sector. Typically, our ballistic rated panels are sought after for the bullet resistance ratings (either NIJ or UL). These exterior buildings are often used to house guards or military officers as a form of access control for a facility or military base. However, these wall panels have can also be utilized in other beneficial ways. 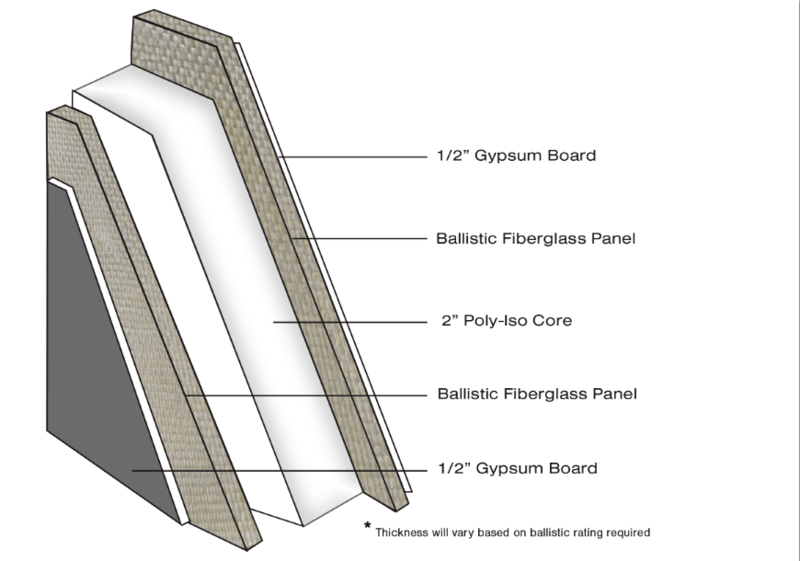 In certain laboratory testing environments, our ballistic panel with gypsum board provides you with the aesthetics of an office environment with the added protection of ballistic fiberglass. This type of shelter will safeguard the outer environment in an area where projectiles or potentially combustible materials are being tested. 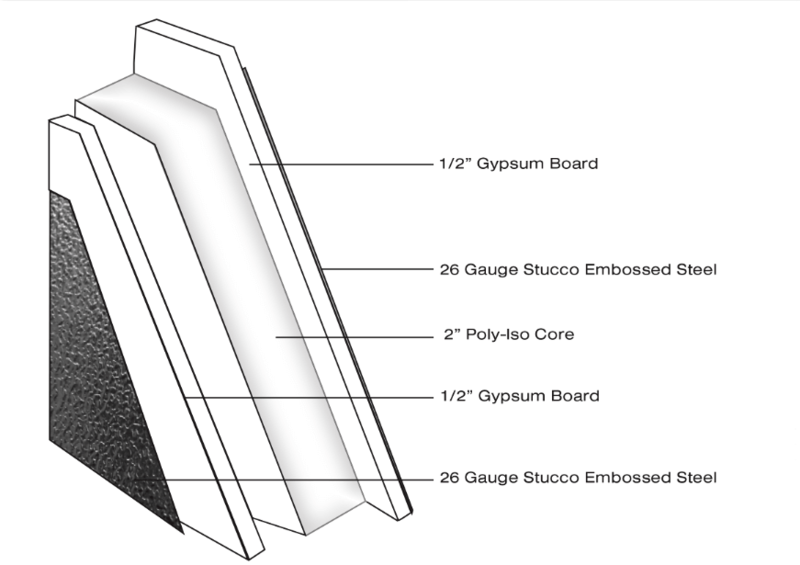 Our standard 3” gypsum/gypsum wall panel with a polystyrene core has a sound transmission coefficient or STC of 31 which provides a good amount of sound dampening for your new office space. 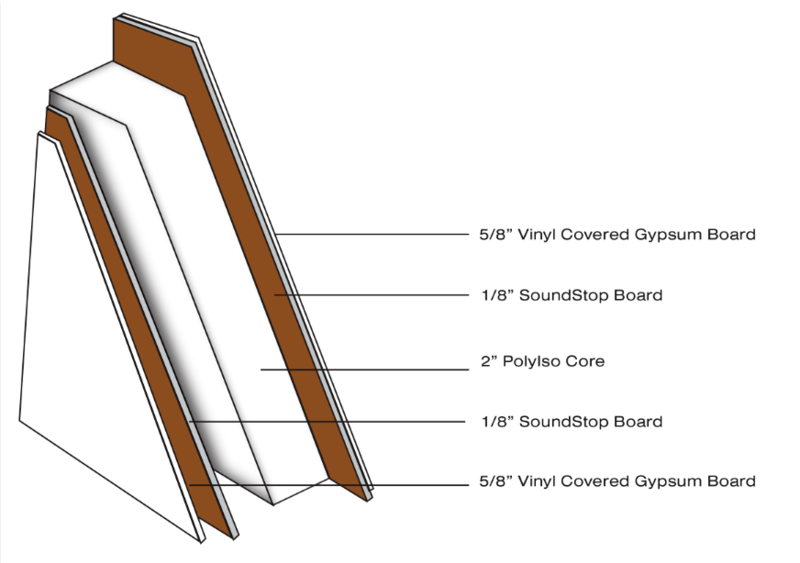 If you are placing your new modular office building in a manufacturing environment or just a particularly noisy facility in general, adding the SoundStop board to your wall panel can improve the soundproofing even more. 1/2” of the SoundStop board itself provides an STC of 23, providing a noticeable noise reduction to the inside of the structure. As the typical warehouse has a decibel level of around 70, and manufacturing environments can have a range of 80-100, some additional soundproofing may be necessary for your office location, in order to pass OSHA requirements. 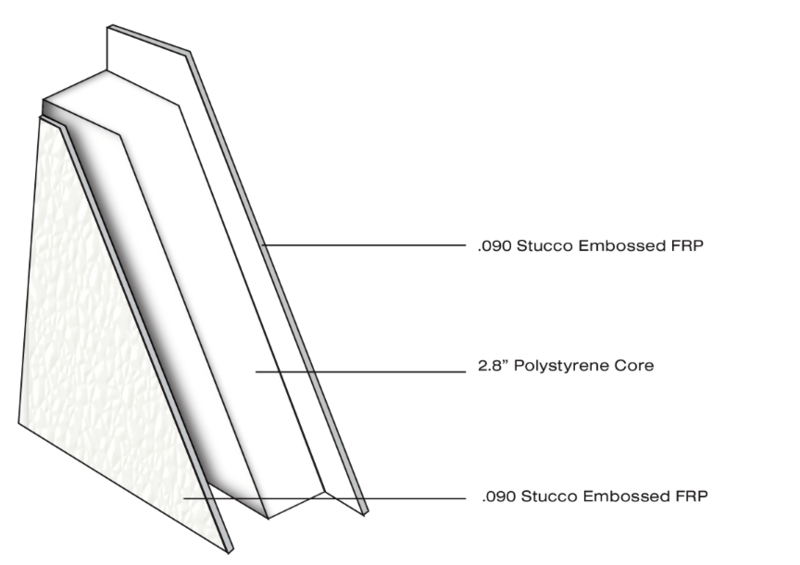 Fiberglass Reinforced Plastic Panels consist of two .08” sheets of FRP and a 2.8” polystyrene core. This type of wall paneling will provide a high degree of flexibility, chemical resistance, easiness to clean, and scratch resistance. Because of this wide array of benefits, FRP has a number unique applications. They are most commonly used in kitchen, bathroom, hospital, and classroom settings for their ability to be easily cleaned. Due to their non-porous surface, they can be cleaned with a combination of water, a mild cleaner, and a sponge, providing for easy cleanup in most situations. For any further questions about our modular wall panels or our modular offices in general, you can contact one of our sales reps, request a quote online, or email us at info@panelbuilt.com with your inquiries.